If ever a place can speak to the soul, then Hudson, NY is my place. I cannot begin to express the love and passion that I have for this quaint & quirky spot. If you're into vintage, old architecture, farm-to-table food, artisanal everything, and book shops that serve beers on tap (yep!) then you too will fall head over heels for Hudson. It's a mere 2 hours by car or train from Manhattan. Perfect for a weekend getaway. No car? No problem! You don't need one where you're going and the Amtrak is my favorite way to travel to Hudson. Hop on at Penn Station (I promise you will find a seat..this isn't Montauk folks!) and be sure to snag one on the far side of the train because you won't want to miss the stunning sunset as you travel along the Hudson River. It will be one of the most serene train experiences of your life. Extra points if you bring a little cheese and wine for the ride up. You will be transported back in time from the moment you step off the train. That's right, it starts at your very first step because this isn't an ordinary train station. It's an old post and the conductor will bring out little wooden step stools for you to exit just like the good ole times. Are you hooked yet? Warren St. is the main drag in Hudson, it's where 90% of the action is. You may be thinking, why spend an entire weekend checking out one street?? Just trust me when I say, you won't even have enough time in a weekend to explore all of the shops on Warren. They are that good. Side note: don't go too off-piste whilst exploring as you may run into the squirrley parts of Hudson, which are a stark contrast to the beautiful Warren Street. The Airbnb selection is top notch in Hudson, so polish off that wish list and book in advance if you want the creme de la creme. There are no commercial hotels in the area, which adds to the charm of this place. There are, however, some incredible boutique hotels that are worth noting. I've had the pleasure of staying at two of the best, The Rivertown Lodge and Wm Farmer & Sons. They have completely different aesthetics, but both spots are equally as charming. The Rivertown Lodge, located at the top of Warren street, blends cozy farmhouse and scandinavian chic. When you enter the lobby you are immediately struck by the open floor plan. There are 2 cozy reading nooks on either side with fireplaces (swoon) and a fully equipped kitchen in the back right corner. So, if you feel like pouring yourself a hot cup of tea before you curl up by the fire to play a game of dominos, go RIGHT ahead! Our room was spacious, clean, and pretty minimal. Here are the highlights of the Rivertown (in my opinion!) The cozy bar around the back of the hotel is great for a drink by candlelight and/or a top notch meal. They are serving up farm-to-table cuisine that really hits the spot. The ping pong table outside and the cute hotel bikes (free for guests!) are added bonuses. I absolutely loved the cozy reading nook on the second floor screened porch-- complete with a shag blanket. My favorite part without a doubt was the brunch. The hotel sets up tables in the lobby and if you're lucky, you can snag a spot on one of the sofas near the fireplaces (early bird gets the worm!) and the food is DELISH. You sure we're not in Copenhagen?! The kitchen in the lobby. Help yourself! Brunch time! He even matches the chair! A little ping pong on a rainy day never hurt anyone! If you're looking for the quintessential country experience, then Wm Farmer & Sons is the hotel for you. The historical buildings that make up the hotel have been beautifully restored and are full of old world charm. Be sure to book one of the rooms with a clawfoot tub and a fireplace- nothing like a hot soak after a chilly day in town. We stayed in the James Louis room which had both..score! Their restaurant below is also pretty incredible. 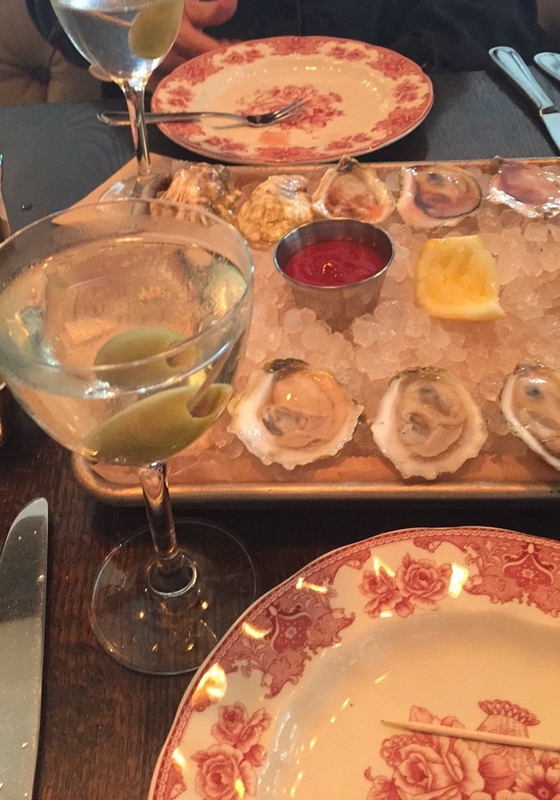 You know you're a long way from Manhattan when you roll into $1/oyster happy hour. A dolla a oysta you say?! Yep, I'll take 24 please&thank you! Also, their dirty martini is arguably the best I've ever had. Always stirred, never shaken! Side note: the hotel is located at the bottom of Warren St. which can get a little noisy from the local riffraff (ie low income housing is a stone's throw away). Nevertheless, this place does NOT disappoint! Oysters and martinis. What more could you want?! - Aeble - I just recently tried this spot and was impressed. Their happy hour is impressive- ever had a $7 dirty martini? Me neither! I had the kale salad and the braised lamb spaetzle. It hit the spot. - Cafe Le Perche - best for coffee and breakfast. Their croque madame is my fav. The Bartlett House is an amazing cafe right outside of Hudson (in Ghent). If you have a car, definitely drive the extra 10 minutes for the best baked goods in the area. Feasting at Bartlett House. They even have blankets if you're chilly! Iceland is THE trip to take these days, especially for East Coasters (under 6 hours from JFK!). And if you're west coast based like me, what better way to break up the long haul to Europe?? I had the great pleasure of spending 3 days in Iceland last summer with my beau, and my oh my what a magical place. It's truly worth the visit if you're into a good dose of adventure. Lately, I have been getting a ton of requests for my itinerary. We were only there for a short period of time, so I did some serious research beforehand so as not to miss out on the best stops. Below, you can find a detailed outline on what to do and where to eat. Just a heads up, most of the restaurants are closed on Sundays and Mondays (at least when we were there in August), so keep that in mind when booking your tickies! And one more thing! Iceland is a major dwelling for elves & gnomes, so be on the lookout folks! Scroll all the way down for more pics! Where to Stay: There isn't an overwhelming amount of lodgings in Reykjavik, so choosing hotel accommodations shouldn't be too challenging. If you're looking to use Airbnb, be sure to book WAY in advance. By the time I started looking 2 months prior to the trip, most of the good ones had already been booked. We stayed 1 night in Reykjavik at Hotel Odinsve, which is a charming boutique hotel conveniently located in the heart of downtown Reykjavik. We then chose to spend the following 2 nights at the Ion Adventure Hotel approximately 45 min south of the city. Their slogan is, "Where everything meets nothing" - I loved that. And as soon as I saw the outdoor geothermal pool overlooking the mossy terrain, I was HOOKED. We had an amazing experience at the Ion. The hotel literally looks like a spaceship dropped down in the middle of nowhere. It's also quite a doozy getting to the hotel, but nonetheless beautiful. After a pretty straight shot from Reykjavik, you turn off onto a gravel road and continue on what seemed like 30 minutes heading into unchartered territory. We kept elbowing each other saying "we are SO lost." But low and behold, we eventually spotted the boxy structure in the distance. However strange the outside, we were pleasantly surprised when we arrived. The interior is clean, modern, and sophisticated. The beds were super comfortable and the rooms were spacious. We were very impressed with the food and also relieved because God knows where else we would have eaten in the middle of nowhere! There is a VERY modest spa at the hotel, with only 1 or 2 treatment rooms, so don't expect a ton of pampering here. You will book this hotel first and foremost for the experience of being completely detached from civilization. Where to Eat: There are two places in particular where you must go for dinner. The first, is Dill. This is THE restaurant to try in Reykjavik and you must make a reservation in advance. Also just a side note, it's only open Wednesday-Saturday. This is the first restaurant in Iceland to receive a Michelin star, so don't expect a cheap meal! But, if you choose one place to splurge, do it here. You will not be disappointed with this farm-to-table, sea-to-table establishment. I promise. The second is Matur Og Drykkur. I love the vibe and the food is delicious. You can't go wrong with seafood in Iceland- it's just so damn fresh! If you can't make it for dinner, definitely go for lunch. If you're like me and experience jet lag in a BIG way, you will want to know where to get the best (and strongest) coffee. The place to go for "the best coffee in Iceland" is Reykjavik Roasters. The environment is friendly and the vibe is Brooklyn meets Seattle. Catch my drift? You'll love it. You MUST go to Saegreifinn for lunch. There will most likely be a line, but trust me, it is worth the wait. The lobster soup is some of the best I've ever tasted and the salmon skewers are like eating butter off a stick. Seriously, it's the freshest fish you will have in Reykjavik. And if you're super daring, try the fresh whale skewer! We weren't able to squeeze in all of the ultra foodie spots I had researched in advance, and one of them was Fridheimer. If your guilty pleasure is Keeping up with the Kardashians (embarrassing I know..), you might recognize this place from their Iceland episode. It's a lunch spot where you will dine on all things tomato (even tomato schnapps!). Oddly enough, tomatoes are a popular produce in Iceland...who would've thunk?! You will sit inside the greenhouse among the tomato vines- major ambiance points there. They describe it as a "unique food experience among tomato plants." Need I say more? Waiting in line at Saegreifinn...definitely worth the wait! What to do: There are SO many activities in Iceland- the options are endless! You may feel overwhelmed choosing things to do, so spend some time ahead of the trip to narrow down your options. You won't regret it. We had a number of things on our to-do list, but alas, there are just never enough hours in a day! Especially when you like to sleep in a little...or a lot... don't judge! Aside from exploring the shops in downtown Reykjavik (which are super quaint), I've outlined some our favorite stops below! You will hear a lot about The Golden Circle while researching things to do. Simply put, it's a hotspot tourist area containing some of the most popular travel-related activities and destinations. After completing an abbreviated version of the Golden Circle, we hit places on our way to Vik, which is a village on the southern coast of Iceland. It's famous for it's black sand beaches and puffins! Pingvellir National Park - first stop on the Golden Circle. It's the location of Iceland’s first Parliament / Rift Valley between North American and Eurasian Tectonic Plates. You can walk it or you can be super daring and dive between the plates (with a tour guide obvi). It wasn't all that exciting, but it's a good one to check off your list. Dog Sledding on Langjökull Glacier - second largest icecap in Iceland. Sadly, we didn't get to do this because they weren't offering it during our stay-- pity! Reykjadalur hike in Hverageroi. This was my FAVORITE part of the trip and you must go, especially if the weather is nice. The hike itself is suited for people of all ages--so bring the whole fam! After about 2 miles uphill (about 2hr hike in total) you will end the hike in the most pleasant natural hot springs river. There's a designated spot to get in--you can't miss it. After some pretty incredible views and active geysers, the hot springs really was the cherry on top of a great day. So, don't forget your bathing suits! There are quasi changing rooms, but it's best to just have it underneath because they aren't that private. And don't be alarmed if you stumble upon an Icelandic goat in the changing room. Early bird gets the worm! Also, just FYI the further downstream you are the colder it is. Depart Seljalandsfoss Waterfall for Seljavallalaug - this is the hot pool in the mountains. About 15 min walk from parking lot to pool. Super cool and GREAT insta opps! Go to Vik for lunch @ Suour-Vik Restaurant-- the food was great! We were really impressed! Depart Vik for Dyrholaey- amazing view of the ocean and black sand beaches. There are also amazing rock formations in the ocean. The birdlife here is abundant, with puffins and eider ducks being the most common species in the area. Then go to Reynisfjara Beach, should be right in that area-- black sand beach you can walk along. Blue Lagoon-- Almost everyone has this stop on their list and let me be the first to tell you it's the MOST overrated place ever. The website is completely misleading because truth be told it is a far cry from the luxurious, spa-like experience in which they advertise online. If it's a MUST for you, then choke up the extra cash for the Premium tickets so you can cut the check-in line and get shower shoes (yes, that's right. If you buy the normal ticket you are going barefoot. Godspeed.) It's only about 20 minutes from the airport, so it's best to book directly after landing or before taking off. Don't go for the latter. Here is my VERY honest take from the Blue Lagoon. You walk into an overcrowded locker room (hopefully with shower shoes!) and find a locker. Then they herd you into showers much like a women's prison and INSIST you take off your bathing suit (I did not). I saw more lady parts than I needed to in a lifetime. Once I got out of that zoo, I thought things were looking up. Wrong. It felt eerily similar to Spring Break circa 2010.. rubbing elbows with strangers on the lazy river at the Atlantis. Only this time I wasn't surrounded by a gaggle of drunk girlfriends making light of the situation. Really, the only positive about the experience was the free drink I got with my VIP ticket (perks, people, perks). And under NO circumstances, should you get your hair wet in that water!!! If you are going to take away anything from this rant, it is that!!! They advise you to apply conditioner to your hair if you plan on going under. I did just that and my hair remained hard and matted for DAYS. Not to mention my bathing suit smelled like horse piss for weeks. Oh and the onsite restaurant, Lava, is a total bust. Overpriced and downright bad. Much better options in the airport. I know what you're thinking...how do you REALLY feel?? Just don't tell me I didn't warn ya! The geothermal pool at the Ion Adventure Hotel....swoon! Nothing like a hot springs river at the end of a hike!